Have you given any thought to teaching your puppy to walk on a loose lead before his first outing? Without this essential training, we inadvertently teach dogs to pull! The puppy who enthusiastically dragged you towards a wonderful scent or person, has learned that pulling works and successful behaviours are repeated. Your puppy must learn that a tight lead gets him nowhere. Walking on a lead is not natural. We expect our dogs to match our stride with ease, however dogs much larger than Spaniel size will not comfortably trot at our side. This pace incompatibility causes gait disturbances such as pacing, when legs on one side land and push off together. A dog that is comfortably trotting will have diagonal pairs of legs landing and pushing off together. 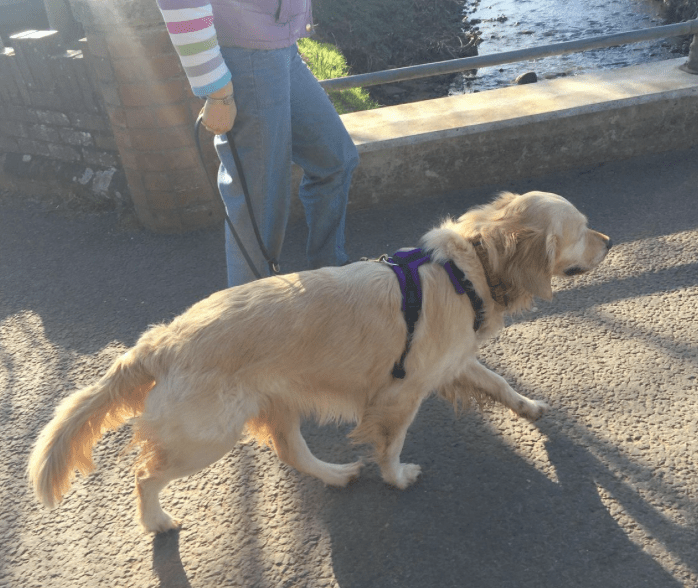 You may need to walk faster to find a comfortable speed for your dog! Teach a puppy to walk on a loose lead by first getting his attention with a treat by his nose and throw it behind you. As he comes back to your side wait for him to look at you and start walking. If your puppy darts forward, stand still and ‘be a tree’ showing him that pulling does not work! Get his attention again and repeat these steps. Food is used to position your puppy behind you, to then walk forward into heel position. An adult dog can learn loose lead walking skills in the same way although it may take you longer. Please don’t use food to lure your puppy to walk by your side since his focus is on the food rather than learning the lead ‘rules’. Don’t ask your puppy to “heel” either, since he doesn’t know the meaning of the word yet, and don’t expect to build good walking rapport with your dog if you are chatting on your mobile ‘phone! ime, teach him loose lead walking skills starting in a quiet place with few distractions.